Safe Harbor is a home for children in need of a safe, loving environment – a place where they are treated like family. Founded in 1991 by Susan and Bob Hamer, a passionate couple dedicated to creating a warm and nurturing environment, Safe Harbor’s mission is to provide shelter and therapeutic services to children any age under 18 who’ve been abused, abandoned or neglected; who are homeless or have run away from home; or who are otherwise at risk or feel threatened. During the center’s 24 years, more than 4,000 children have sought refuge at Safe Harbor for at least one night. During 2011, more than 226 children and families were recipients of services provided by Safe Harbor. 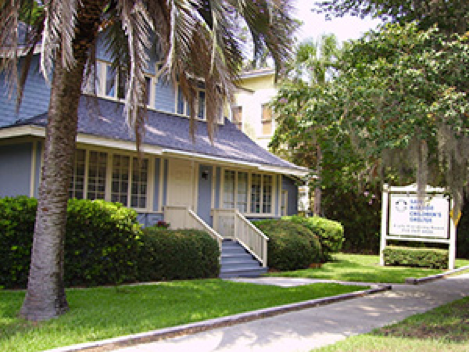 The Safe Harbor Children’s Center is a spacious home with room for engaging play, quiet study, and intellectual and emotional development. afe Harbor’s around-the-clock services include crisis intervention; food, clothing and shelter; medical care; life skills training; tutoring; job skills assistance; recreational, social and cultural activities; and an aftercare program. Individual, family and group counseling, as well as parental and family support services, are at the core of Safe Harbor’s offerings. Reunification of the child with his or her family is Safe Harbor’s top priority and these counseling services are a key to this process. Our community’s home for children in need of a safe place, Safe Harbor is governed by a volunteer board of directors and receives support from the Safe Harbor Auxiliary. A private, not-for-profit, 501(c)(3) organization, Safe Harbor is licensed by the Georgia Department of Human Resources’ Childcare Licensing Division and receives funds to support its mission from state and federal grants and local fundraising events. Safe Place serves youth in crisis by maintaining Safe Place sites that offer access to Safe Harbor provides a haven for children seeking safety for those children who have no other place to turn; Safe Place, a national program coordinated locally by the Safe Place Team which maintains 136 Safe Place physical sites and 126 Mobile sites throughout the community. Safe Harbor provides workshops and presentations to children in area schools, giving out materials and answering questions. Our Street Beat program is a street outreach program that canvases neighborhoods reaching out to teens living on the streets. Caring staff build trusting relationships, provide nutrition and hygiene kits, sexual exploitation literature, and provide support for those youth who want to come off the streets. Young people receive help completing their education, planning for careers and maintaining housing. Street Beat’s mission is to increase young people’s safety, well-being and self-sufficiency and to help them build permanent connections with caring adults with the goal of getting off the streets.